Up front I will say that I’m a Stephen King fan. On his worst days he’s better than most writers on their best days. His descriptive abilities and attention to detail paint mental pictures with a texture that is unmatched. Remember The Beatles? The world’s most famous and most popular band? They had 20 number 1 hits. Stephen King is The Beatles of writers. At least for me he is. Although The Beatles had twenty #1 hits, with twelve albums there were probably about 100 other songs from those albums that weren’t #1 hits. Stephen King has had a lot of #1 hits. Revival may not be a #1 hit, but it’s not bad either. The story of Revival follows the long and winding road of Jamie Morton’s life from the time the young boy meets his towns new pastor until Jamie is an elderly man who witnesses the strange end of the man he had met so many years before. 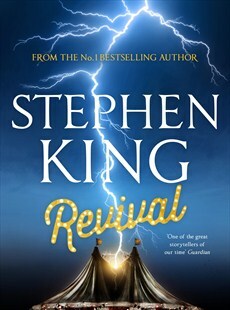 In Revival Mr. King weaves a path for Jamie Morton that you are more than happy to follow through his happiness and heartbreaks. Strangely, Jamie’s path through life seems intertwined with that of his childhood pastor who, after a personal tragedy, turns away from religion as we know it to something that he believes may answer all his questions. In order to protect others, repay a debt of gratitude, and possibly satisfy his own curiosity Jamie becomes his accomplice, helping him see his final experiment through to the end. And for me as a reader that was where the only bump in the long and winding road of this story appeared. Through the first 95% of this story I was all in, hook, line, and sinker. Loved it. Rooted for the protagonist. Wanted to figure out the mystery. Couldn’t wait to get to the next chapter. Then in the climactic scene, almost out of the blue Stephen King made it just a tad too weird. Following the climactic scene there was a nice wrap up and post script for the characters with even a little chilling/haunting reminder of what might be just behind the curtain that we can’t see. Would I recommend this book? Absolutely, but temper your expectations just a little. 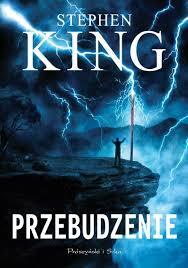 It’s not an all-time classic, literary Hall of Fame Stephen King novel, but it’s still Stephen King. It was a fun ride that I enjoyed from start to finish, and you know what? Just because I didn’t jump for joy at one scene doesn’t mean that I’m right or that you won’t love what I didn’t. It was a fun read and I don’t regret the money or time invested in it. In honor of the anniversary of the assassination of President John F. Kennedy I thought I would re-post an amended version of my review from earlier this year. 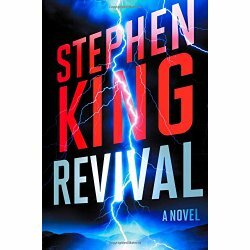 Yes, I realize that Stephen King doesn’t need my review to help his sales, but every once in awhile you read a book that captures your imagination so much that you want to tell everyone to read it. 11/22/63 is one of those books. When it first came out in November of 2011 I had no interest in reading the book. I hated the title and the cover art. That’s usually enough to steer me away from any book. I am a Stephen King fan though, so about 6 months ago when I hit a dry spell in finding a book to read I gave 11/22/63 another look. Two things helped to convince me to give it a chance. The new book price had come down after it had been out over a year and I read the synopsis and discovered that it was a time travel story. Anyone with an imagination has thought about time travel. Most of us have wondered about the great what ifs both large and small, whether it be correcting mistakes in our own life or changing the world for the better. In the end 11/22/63 turns out to be a surprising love story with a surprising ending that Stephen King credits to his son Joe Hill, who is a successful horror/suspense writer in his own right. As with any Stephen King novel, going in you have to know you’re making a significant time investment, but for this ending 11/22/63 is worth it. Yes, I realize that Stephen King doesn’t need my review to help his sales, and often I try to support indie authors with my Tuesday blog interview, but every once in awhile you read a book that captures your imagination so much that you want to tell everyone to read it. 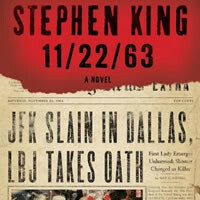 11/22/63 is one of those books. Don’t worry, I’m not going to give out any spoilers here. In 11/22/63 school teacher Jake Epping is a likable fellow but a little lonely since his divorce. When his elderly, ailing friend reveals to Jake that he has discovered a “rabbit hole” in the back room of his diner that takes a person back in time Jake is of course skeptical, until he tries it. Once convinced, Jake’s friend throws out the really big bait. What if Jake could travel back in time to stop the Kennedy assassination? Would the Vietnam war be avoided thus saving thousands and thousand of young men’s lives? What other positive changes to history might occur if John F. Kennedy hadn’t died? Of course if everything went according to plan Mr. King wouldn’t have much of a novel here, and that’s where this story gets really fun. What if, when you travel back in time, every little thing you do has a ripple effect that leads to unintended changes that you can’t possibly foresee? What if your interactions with people changed the course of their lives? What if, when you got back to your future it was drastically changed, and not for the better? In the end 11/22/63 turns out to be a surprising love story with a wonderful, surprising ending that Stephen King credits to his son Joe Hill, who is a successful horror/suspense writer in his own right. As with any Stephen King novel, going in you have to know you’re making a significant time investment, but for this ending 11/22/63 is worth it.